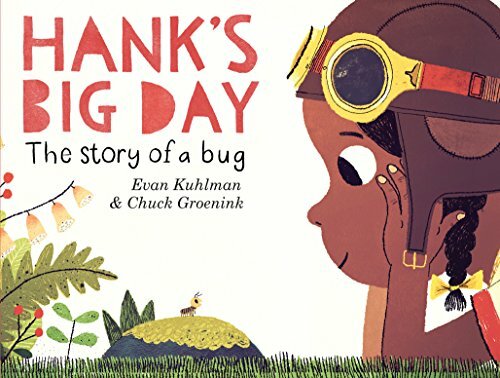 Summary: A day in the life of Hank, the pill bug, begins with him crawling out from beneath his rock home and setting forth through the grass, across the sidewalk, and to the home of his best friend, a girl named Amelia. Today Amelia is pretending to be Amelia Earhart, and she puts Hank on top of her leather helmet and takes him for a ride. After an afternoon playing together, the two friends gaze at each other lovingly (an illustration labeled “what friendship looks like”), then Hank reverses his morning journey to get back home. The last page pictures him happily asleep under his rock. 40 pages; ages 3-7. Pros: This would make a great springboard for young writers to imagine other animals’ days. The illustrations are large and colorful with many humorous labels. Cons: Pill bugs are nowhere near this cute in real life.